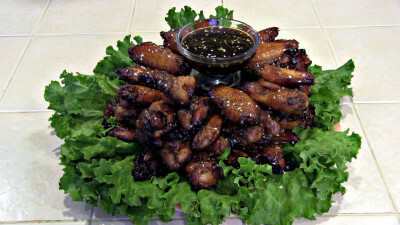 SmokigPit.com - Sesame Soy Chicken Wings slow cooked on a Yoder YS640 Pellet smoker. BBQ meets Asian cuisine. A nice balance between savory and sweet. These wings will be a hit at any feed! The first thing to do is pre-heat your cooker to 240 degrees. 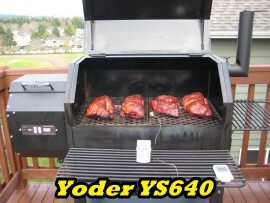 In this cook I'm cooking on my Yoder YS640 using Bear Mountain Cascade Alder wood pellets. Next we will prepare the chicken. Start by rinsing 3 to 3.5 pounds of party wings. These are wings pre cut up. If your store doesn't carry them then buy the regular wings and cut them up yourself. Pat them dry and place them into a two one gallon Ziploc bags. I tend to put all the drumstick pieces one bag and the others in the second bag. I do this because I place all the drumsticks on one smoking rack and the others on to a second rack. I then place the thicker meat near the hotter end of my cooker. Mix this thoroughly with a fork or whisk making sure to dissolve and mix in all the honey. 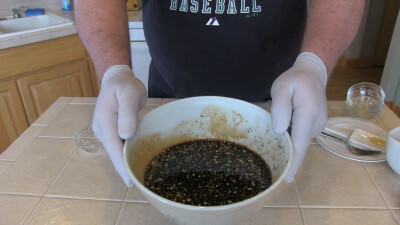 Once the marinade is mixed pour 1 1/4 cups into a bowl and set aside to use later for mopping the chicken and for a finishing sauce as well as a dipping sauce. Squeeze out all the air from the Ziploc bags and close them. Place the bags flat in the refrigerator and allow the wings to marinate for 3 hours. 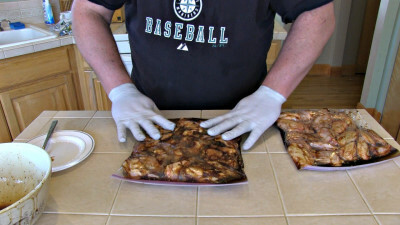 Once the wings have marinated for three hours remove them from the fridge and drain the liquid from the bag. Pre-heat your cooker to 240 degrees. You don't want to go any higher than this as the sugars will burn. 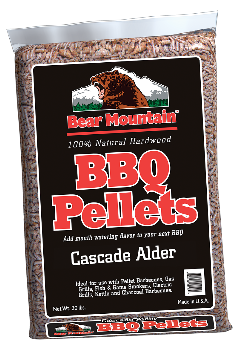 In this cook I'm using Bear Mountain Cascade Alder wood BBQ pellets. 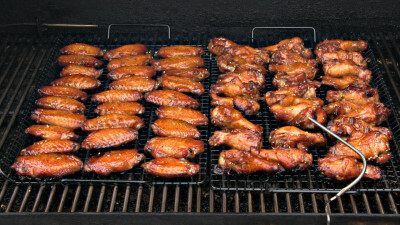 Place the wings on greased smoking racks. Once the cooker has reached 240 degrees place the wings into the cooker. 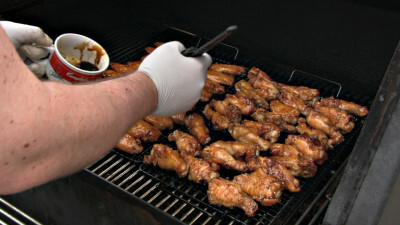 The target internal temperature for the wings in this cook is 175 degrees. This temp will produced wings with meat that easily pulls away from the bone but is not over cooked by any means. Allow the wings to cook for 1.5 hours. Separate the left over marinade into two cups. 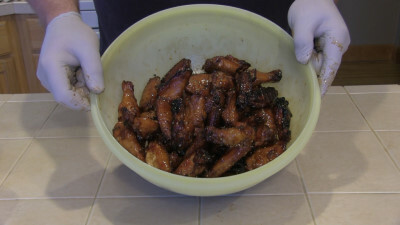 Using one cup of marinade, mop the wings and then flip each wing over and mop the other side. Continue cooking until the internal temp reaches 175 degrees. Once the wings have met the target temp, remove them from the cooker and place in a large bowl. Divide the remaining marinade into two equal halves. Heat one of the halves and pour it over the wings. Using your hands gently toss the wings in the marinade coating all the wings. Plate up the wings to serve. Serve the remaining marinade as a dipping sauce. Enjoy this taste of Asian cuisine. Thanks for viewing and enjoy this recipe.